If you or your child have a red, itchy eye with discharge, then you may have pink eye. Also known as conjunctivitis, pink eye is the inflammation of the conjunctiva or the thin, clear tissue that lines the inside of the eyelid and covers the white part of the eye, acccording to WebMD. Pink eye can occur in one or both eyes. Is pink eye contagious? Yes. Pink eye can be very contagious and early treatment can help you to feel better and limit its spread. 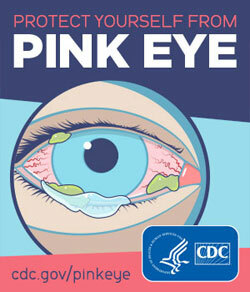 Pink eye can be caused by a virus, bacteria, or allergies. According to the Mayo Clinic, “most cases of pink eye are caused by a virus.” Pink eye can also occur with a cold or respiratory infection. Bacterial pink eye can be caused by contact lenses that are not clean. Viral and bacterial pink eye are highly contagious. Ultimately the best way to lessen the spread of pink eye is to stay home from work or school until 24 hours after starting treatment. However, the Mayo Clinic says that pink eye is no more contagious than the common cold, so it is OK to go to work or school. Practice good hygiene to limit its spread. Stop by Advanced Urgent Care & Occupational Medicine in Brighton, Northglenn, or Ft. Lupton to get treated quickly for pink eye. Walk-ins are welcome or you can reserve your place in line online here.